Robert Bouchet was a multi-skilled craftsman - in fact, guitar making was something he took up quite late in his life. He was primarily an artist, painting in the Impressionist style, and for many years he taught painting in Paris. He was a self-taught guitar maker, and he made his instruments by studying guitars made by Torres. He also had the opportunity to observe the Paris based maker, Julian Gomez Ramirez, who was a close friend. Bouchet had a natural gift as a luthier, and Julian Bream owned three of his guitars. 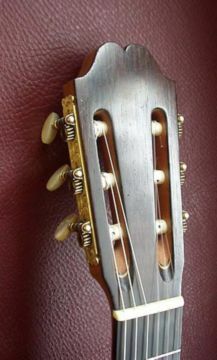 Bouchet is often thought of as having been the first luthier to introduce the "bridge bar" (a large strut glued to the under-surface of the soundboard, under the position of the bridge-saddle. In fact Bouchet was the first to explain that he had seen this in a guitar by Torres. Bouchet liked the idea, and he experimented with this as a way of controlling the sound and stabilizing the bridge. Although he did not make a large number of guitars, they were widely sought after, and nowadays they are extremely valuable. The plan offered here is for a Bouchet design with five fan struts and a bridge bar.